I can still remember the moment the moment my doctor told me we were having twins. I’m fairly certain my first response was to tell her to put one of them back. Well, it doesn’t really work that way. I am happy to report now that, despite our initial shock and fear, having twins is amazing. Not only do I get to watch my babies grow up, I get to watch them grow up along side each other, enjoying the world together. I am also happy to report that having twins isn’t as daunting as I thought it would be. There are challenges, don’t get me wrong. But it is completely doable. 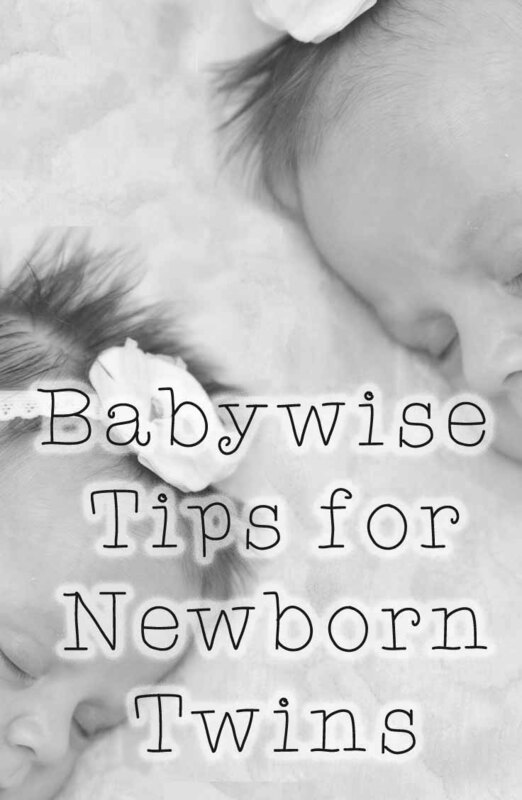 Babywise is a major reason I think we have been able to make the transition from one child to three without falling apart. For newborns there are basically two major things they do. Eat and sleep. Okay, yes there is the waste disposal part. But that is something that you can’t really put on a routine. I will say if you are changing one twin, save yourself the trouble and just change the other too. But back to the first two, eating and sleeping. These are the areas in which Babywise helped me the most. I do have a few tips for these areas that are twin specific though. Before we get to far into this, I want to note that it is completely possible to exclusively breastfeed twins. I was a little worried about how I was going to do it. I was able to breastfeed my older son, so most of my worries were fortunately just the logistics of how you hold two babies at once. Even though I had experience breastfeeding, I was still taken aback by how many people seemed to assume it wouldn’t be possible. There are a multitude of reasons why breastfeeding might not work. Twins just add more reasons to that list. But if it something you want to do, don’t let anyone tell you it will be too hard. Yes, it can be hard. Anything worth doing is hard though, right? Find another twin mom to help you out with holds, make the lactation consultant stay with you until you have it right, and don’t give up. 1) Feed the twins one at a time. You can nurse at the same time, but honestly at first do it one at a time. I know, newborns eat All. The. Time. Two newborns? You’ll never get off the couch. It can feel like that sometimes. But a goal is to get as complete of a feeding as possible every time. It is hard to keep a newborn awake to eat. Keeping two awake at once is practically impossible. Trust me, I tried. You get one sucking away and the other falls asleep. So you work on the sleepy one a bit, and the first one passes back out. Stick to one at a time for the first couple of weeks. At about a month I found it was easier to nurse at the same time. In order to do that, get a twin nursing pillow. It is a lifesaver. I love My Brest Friend Twin Nursing pillow. Hate the name, love the pillow. 2) Feed both twins at the same time. Yes, this totally goes against what I just said. What I mean by this though is if one twin eats, the other eats immediately afterwards. This gets them on a similar schedule, if offset by a little bit. My girls were super sleepy for the first couple of weeks. They didn’t eat for very long before I just could not keep them awake. So they were offset by about 15-30 minutes each meal. Those first few weeks if one was hungry between feedings I would feed her, then offer the other a meal as well. The goal is to keep them eating as close together as possible so when you do switch to feeding them at the same time it is easier. Plus I know eventually you hope to get off the couch and do something besides feed babies. This means getting both twins on the same schedule. 3) Start with more frequent feedings, and drop feedings verrrrry slowly. I know for me at least it was hard to keep the girls awake for their feedings. And it was made harder by knowing there was someone else waiting to eat. If the girl I was feeding just would not stay awake and her sister was raring to go, I would switch babies. This means that they might not get the fullest of feedings. I know Babywise says to do anything you can to give your baby a full feeding, but sometimes it just doesn’t work out. Any mother knows that feeling when your baby is crying and wants to eat. It doesn’t feel good! If the baby I was currently feeding was satisfied enough to stop nursing and fall asleep, I would switch. In order to make sure they still ate enough and I produced enough I fed them every two to two and a half hours at first. Once they were eating at the same time it was easier to make sure they had enough to eat. Conversely, when it comes time to drop feedings do it very slowly. Each breast is making a full meal, not just part or half of one like when you nurse a single baby. That makes it harder on your body when you skip a feeding. My girls went from having 2-3 feeds in the night each to 1 each in about two days. That hurt. I don’t know if there is really a way to prevent that sort of thing, but it is something to be prepared for. 1) Like with eating, when one twin sleeps, the other sleeps. This is hard to do at first as well. I mean, newborns sleep when they want to sleep. But after a few weeks when you start to notice sleepy cues, put both down for naps. By having your twins nurse as close in time to each other as possible, they should naturally get sleepy at the same times. It is tough to put down a baby to nap that doesn’t seem completely ready for it. You have to keep your eye on the prize- babies that nap at the same time. And remember a good thing that comes from doing this is that my girls have learned to be put down drowsy but awake from the start. one baby you may only have to go to your child a couple of times during naps, depending on what technique you choose to use to encourage sleeping. For newborns we don’t really do much in terms of sleep training. If the girls cried, we went to them to comfort them. With two babies, that does seem to mean you are in there twice as much. One nice thing about twins is that the other baby crying doesn’t seem to disturb them. But I found they didn’t usually sleep peacefully at the same time. One thing I tried to be strict about for naps is where they sleep and for how long. I did whatever I could to keep the girls in their beds for the duration of the nap. And yes, that meant going in and out of their room frequently. I know an option is to move the not sleeping baby to a swing or bouncer to complete the nap. But with two that just got harder. We don’t have room in our small house for two swings. Plus I really couldn’t just sit and bounce babies with my two year old running around. Then add the mom guilt that I was somehow playing favorites if I got one baby up early… I’m not going to lie, it is hard. My husband came home to a stressed out wife a lot. But it is so worth it that the girls now nap where they are supposed to. They sleep at the same time, which means I don’t constantly have someone sleeping. It also means I have a couple of hours during the day to get things done! Win! 3) Be ready for night sleep to be a little messy. I was strict on naps. I decided for night time to cut my losses and toss out a bunch of Babywise stuff. 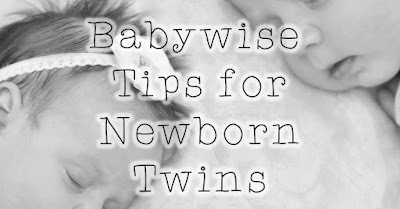 I know, I’m talking about how awesome Babywise is and here I am saying we ignored it at night! It comes down to prioritizing. My husband’s and my goal was to get some sleep during the night. Two babies means twice the wake ups. And the two year old was always raring to go in the morning. We needed to get whatever sleep we could. We kind of co-slept a little. As the girls ate at an offset during the day, they usually woke up at different times at night. This was actually a good thing. I could take whichever girl was awake and nurse her lying down in bed. Then I would switch to the other. Once I got the go ahead from the pediatrician to let the girls sleep as long as they could at night, I didn’t wake one up if the other ate. It didn’t always work out, but often I felt like I got more sleep this way than when my son was a newborn. It did take the girls longer to sleep through the night than my son, but we were better rested along the journey. Priorities people. No one wins if mommy can’t keep her eyes open. 1) Use the consistent wake up time! This is one of my favorite things I have learned from Babywise. Even in the early newborn days having a set time to start your day (regardless of what time it actually started, or if it never ended…) sets up tiny bellies to form a routine. Having a newborn can get crazy. Having two can get even crazier. You might not be able to stick to the schedule every day, but starting at the same time gives you a better shot. 2) Rely on your spouse. Or partner. Or a grandparent. Whoever your other caregiver is. The newborn days can seem like they are all about the mother. If you are nursing that makes sense. But when you are nursing one at a time at first someone might be needed to soothe the other baby until it is her turn. Once the babies are eating at the same time sometimes you need help if one spits up, or just doesn’t want to be on the nursing pillow anymore. At night, well, that’s pretty clear. Two crying babies? One person can’t handle that in a timely fashion. This was a hard one for me. I want to be able to do everything for my children. But no one wins that way. You and your spouse need to be in it together. Having a supportive co-caregiver is key. 3) Prioritize. Even with twins you can do everything. But you can’t do everything on the same day. Sometimes you can’t even do it all in the same week. You have to build up to a solid schedule. I focused on getting the feedings in first. 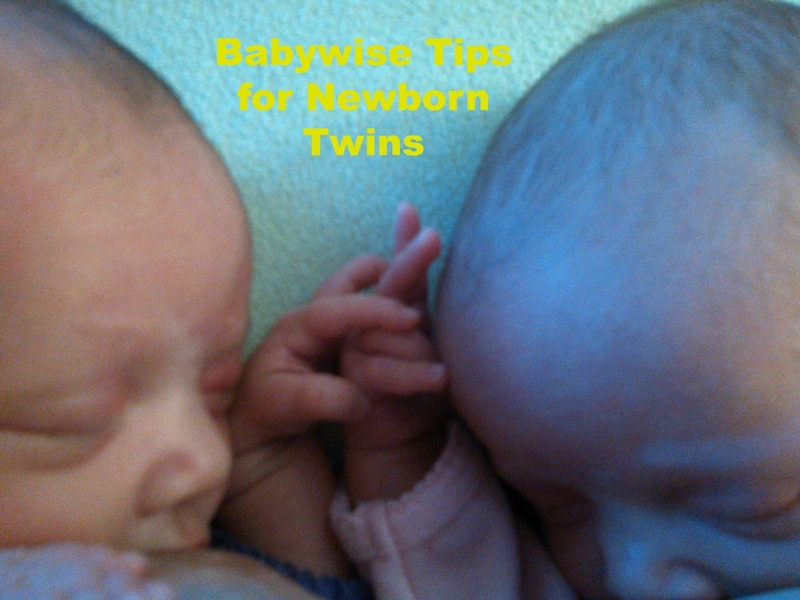 Twins are usually smaller than other newborns, so getting plenty of food in them is key. After that I focused on sleep. I didn’t try to get every nap perfect at once. We did one at a time. First the morning nap, then the afternoon. I knew the midday and evening catnaps are some of the quickest to go, so I chose not to stress about those. Why make them perfect when they will be on the way out soon? I didn’t want to stress myself out trying to get everything perfect all at once. Expect things to take a little longer. You have two new little ones to get to know. Give all of you time to figure things out. Those are my major tips for life with newborn twins using Babywise. I think using these techniques made our introduction to twin life so much easier. My girls are healthy, growing, and happy. I am able to nurse them exclusively. They sleep! Which means I sleep! And because they are on a schedule we can get out of the house. I am so thankful for what I have learned from Babywise.